The Australian shepherd is a breed of herding dog developed on ranches in the Western United States. Despite the name, the breed, commonly known as an Aussie, did not originate in Australia. The breed rose in popularity with the boom of western riding after World War I. They became known to the general public through rodeos, horse shows, and through Disney. For many years, Aussies have been valued by stockmen for their versatility and trainability. While they continue to work as stockdogs and compete in herding trials, the breed has earned recognition in other roles due to their trainability and eagerness to please. The Aussie has considerable energy and drive, and usually needs a job to do. It often excels at dog sports such as agility, flyball, and frisbee. They are highly successful search and rescue dogs, disaster dogs, detection dogs, guide, service, and therapy dogs. Above all, they can be beloved family companions. The Australian shepherd is of medium size and of solid build. The standard calls for the Australian shepherd to stand between 18-23 inches at the withers, females being 18-21 inches and males measuring 20-23 inches, however, quality is not to be sacrificed in favor of size. Aussie colors are black, red (also sometimes called liver), blue merle (marbled black and gray), and red merle (marbled red and silver or buff); each of these colors may also have copper points and/or white markings in various combinations on the face, chest, and legs. A black or red dog with copper and white trim is called tricolour, a black or red dog with white trim but no copper is called bicolor or. White, rather than pigment, around the ears is an indicator of increased risk for white-related deafness. Two different eye colours could indicate later blindness. Excessive white on the face and ears can place an individual dog at greater risk for sunburn. Black Tri, with tan points and/or white markings on the face, collar, legs, chest, underbelly. Solid black dogs are equally desirable as ones with tan and/or white. Red (Liver) with or without tan points and/or white markings on the face, collar, legs, chest, underbelly. Either white or tan points are required. Solid Red dogs are equally desirable as ones with tan and/or white. 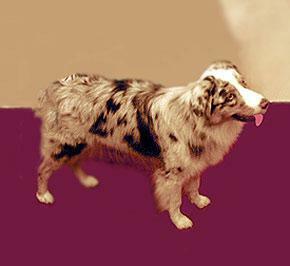 Blue Merle (a mottled patchwork of gray and black) with or without tan points and/or white markings on the face, collar, legs, chest, underbelly. Neither white nor tan points are required. Solid Merle dogs are equally desirable as ones with tan and/or white. There is a great deal of variety in the Aussie's eye color. An early nickname for the breed was "ghost-eye". Aussie eyes may be any shade of brown, or blue; they may have two different colored eyes, or even have bicolored or "split eyes" (for example, a half-brown, half-blue eye), which appear to be linked to the merle coloration. Merled eyes can occur as well, where one color is mixed in and swirled with another. Any combination of eye color is acceptable in the breed standard, as long as the eyes are healthy. In general, black Aussies tend to have brown eyes, while red Aussies tend to have amber eyes, though these Aussies may also carry the blue eyed gene. A hallmark of the breed is a long bobbed or docked tail in countries where docking is still permitted. Some Aussies are born with naturally short bobbed tails, others with full long tails, and others with natural partial bobs, where the tail is midlength and appears stubby. Breeders have historically docked the tails when the puppies are born. Even without a tail, the wagging movement of the hind end still occurs. Some Australian shepherd breeders try to keep the tail on the dog for the natural look.